Net Entertainment already boast a particularly impressive range of oriental-themed Video Slots, and whether Koi Princess, one of their more recent oriental-themed slot went on to achieve huge success, attacking thousands of players, thanks to its fast-paced, bonus-filled gameplay. 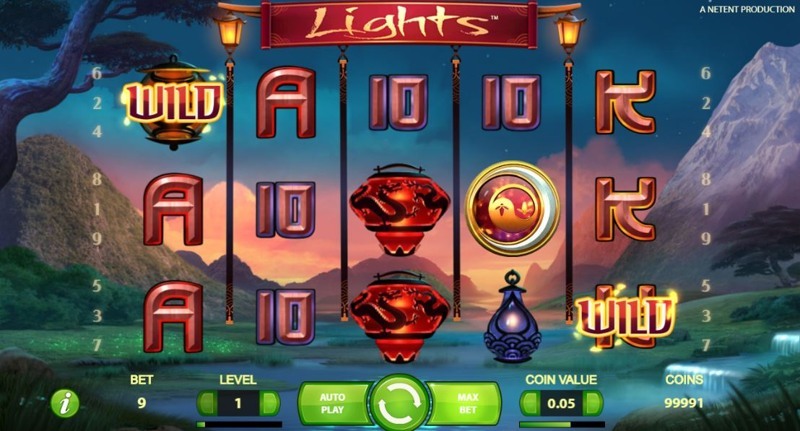 Lights is yet another addition to Net Entertainment’s Oriental range, and this beautifully-designed Video Slot offers an extremely soothing, relaxing, and laid-back gaming experience. Using 5 reels, and just 9 pay lines, Lights – at first – appears relatively basic, but dig into the inner-features of the game, and you’ll find yourself on a mystical journey, aided by the gorgeous scenery and design. Playable from as little as £0.09 per spin, Lights attracts all types of player, and while the max stake is a somewhat reserved £90, 99% of players will find a perfect stake-size for their play session, thanks to Net Entertainment’s easy-to-use bet and coin adjusters. Lights is available for desktop and mobile players, and runs flawlessly across almost all devices, with phones and tablets able to run the game without any problems whatsoever. In fact, many mobile players end up heading to a desktop device to play, simply because of the High-definition graphics; it seems a shame to have them go to waste on such a small screen. The background of the Video Slot features a stunning mountain range, with a lake embedded at its feet. The sky is a mixture of blue and pink, and, set at night, the game is lit using – yep; Lights. The reels include two variations of symbol; first, you’ll find the lower-paying playing card symbols, including 10, Jack, Queen, King, and Ace, and the high-paying symbols are represented mainly by Chinese Lanterns, with Blue, Green, Orange, and Red being the different colours. You’ll also see a Wild symbol, as well as a Yin Yang, which acts as the scatter symbol. Before each spin, you’ll notice there are no wild symbols in view, on the reels. However, once you’ve pressed spin, fireflies will fly around the screen, randomly adding between 2 and 4 wilds to the reels, every spin. This guarantees you at least two wild symbols every time you spin – in the base-game – and this unusual wild-distribution can help award big base-game wins. The free-spins round is triggered by landing 3 of the scatter symbols anywhere in view, and this allows you to enter the free spins bonus. The scatter symbols are represented by the Yin Yang symbols, and you’ll be awarded either 10, 20, or 30 free-spins, depending on whether you land 3, 4, or 5 of the scatters. During the free-spins round, the reel-set remains, and the fireflies are still active on each spin, but you’ll notice that within the bonus-round, between 3 and 6 wilds are placed on the reels, instead of the base-games 2-4. This guarantees you at least 3 wilds each spin, and while that doesn’t 100% aid a win, it gives you a great chance of making lucrative 4-of-a-kind and 5-of-a-kind pay lines. You can also trigger more free-spins by landing another 3, 4, or 5 scatter symbols during the feature.